Gardening has been described as ‘interfering with nature’, because in our gardens we try to make plants grow where they do not normally thrive and remove all those plants which distribute themselves naturally. In the wild state each plant grows in positions best adapted to it, and there, together with its neighbors, it covers the ground with a mantle of greenery; this prevents the evaporation of moisture from the soil, ensures a constant deposit of decaying leaves which acts as a mulch and restores goodness to the soil, carried down by the worms and by rain. Many of our most highly selected strains of flowers and vegetables grow best in isolated groups or rows, in soil that is cultivated. Even here a mulch of decaying matter will help greatly to foster health and prevent weeds. In a garden devoted to shrubs, perennial plants and bulbs, something more closely approaching nature can be attempted with a consequent quiet and gentle appearance and a lessening of cultivation; in fact digging and hoeing can be forgotten. In attempting this type of gardening, by which the largest area can be tended with the least labor, everything depends on cleaning the ground thoroughly first, and on the choice of plants. It is essential that all perennial creeping weeds be eradicated; it is wise in the first year to plant only the shrubs (and trees) so that the ground can be watched for a recurrence of weeds. Thereafter the ground-covering plants can be put in. Until they have grown and made a dense cover we can resort to covering the intervening spaces with a mulch of decaying vegetable matter—lawn mowings, garden compost, dead leaves, soft clippings, peat, wood or bark shavings, etc. (Fresh sawdust wood or bark shavings when placed on the ground are apt to absorb nitrogen from the soil during decomposition; this must be restored by applying sulphate of ammonia or Nitro-chalk.) Modern weed-killers can also be used temporarily. The most economical use of garden space is by gardening in several layers: at the top are the scattered trees, lower in height are the shrubs, and covering the ground in sun or shade the prostrate shrubs and perennials, with bulbs spearing through them. Trees in gardens do not act as ground cover, but shrubs and plants wisely chosen will do so, permanently and effectively. Viburnum tomentosum mariesii ; Choisya ternata ; Siphonosmanthus dela vayi ; Camellia japonica ‘Lady Clare’ ; Hydrangea macrophylla ‘Blue Wave’ ; Garrya elliptica. Gaultheria shallon ; Rosa rugosa alba ; Rubus odoratus, R. nutkanus (R. parviflorus); Xanthorriza apiifolia. Hydrangea petiolaris ; Hedera helix hibernica ; Euonymus radicans carrieri ; Rosa wichuraiana (the species); R. ‘Max Graf’ ; R. paulii ; Vitis vitacea. Cotoneaster dammeri, C. conspicua decora ; Potentilla arbuscula ‘Charles Musgrave’ ; Erica carnea `Springwood’ ; Juniperus, various prostrate species and varieties ; Stephanandra incisa prostrata ; Hebe subalpina. 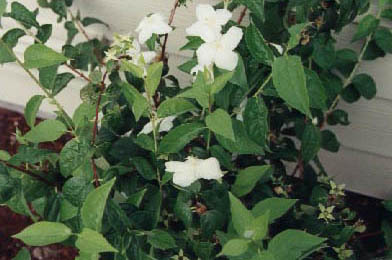 be needed to plant under established trees or to cover areas while other shrubs and trees are growing; someexamples are the hedera and the gaultheria mentioned in (b) above, neither of which are to be trusted in the average garden of today; others are Hypericum calycinum, Vinca major varieties, Luzula maxima, Trachystemon orientale. In wet ground Lysichitum americanum is ideal. In designing a border to be almost self-supporting it is necessary to know the eventual shape and size of all the shrubs and plants to be included; the spaces between shrubs can be planted with quick-colonizing, low plants over which the shrubs will gradually grow and suppress. But ground-covering plants bring not only the suppression of weeds and the conserving of moisture and fertility : they also are flowering plants in their own right, and contribute to the garden scene through the year, providing the lowly and diverse greenery that is needed to make effective contrast and texture to that of the shrubs. Even so, while they are mostly flowering plants, few of them flower for more than a few weeks and their foliage is, therefore, particularly valuable. Brunnera macrophylla, epimedium, Geranium macrorrhizum, G. renardii, G. ibericum platyphyllum, G. endressii, pulmonaria, tellima*, Stachys macrantha, Alchemilla mollis, Phlomis russelliana. Yet another category is that of the tall but clump-forming perennials which cover a large area when established, e.g. Aruncus sylvester, Cynara cardunculus, hemerocallis, Verbascum vernale, paeonia and hosta. Ferns are extremely useful in the shade; Dryopteris felix mas and various polystichums for dry shade, clump forming; thriving in moist ground and of strong colonizing habit are Onoclea sensibilis and Matteuccoa struthiopteris ; for moisture and forming large clumps, Osmunda regalis ; smaller ground cover is found in Polypodium vulgare for drier positions. Varieties of Hedera helix, the common ivy, are also good for shady banks, but take some years to create an impenetrable carpet. Luzula maxima is an ideal substitute for shady banks where grass mowing is difficult, and thrives best in cool, moist districts. The most difficult positions to cover are. found under big trees such as elms, beeches and cedars. Few plants will grow under the first two; but Hedera helix hibernica usually succeeds if the tree branches are high. Under cedars and other trees Cyclamen neapolitanum will establish itself, particularly on on limey soils; an annual which will thrive in the same conditions is Oxalis rosea. For almost any position in sun or shade, on chalk or light or heavy soils, Hypericaum calycinum will be successful, while for really small borders many of the mat-forming rock plants are without peer, such as Dryas sundermannii, antennaria, acaena, cotula, ajuga, `mossy’ saxifrages, Hypericum rhodopaeum, and many of these are suitable as anti-splash plants for small bulbs.